Arbeitskreis Geschichte des Kartonmodellbaus (AGK) e.V. - Arbeitskreis Geschichte des Kartonmodellbaus (AGK) e.V. The "Arbeitskreis Geschichte des Kartonmodellbaus (AGK) e.V." is a German non-profit association. We investigate and document the history of card modeling (papercraft) in Germany, Europe and all over the world from its beginning (around 500 years ago) to the present. 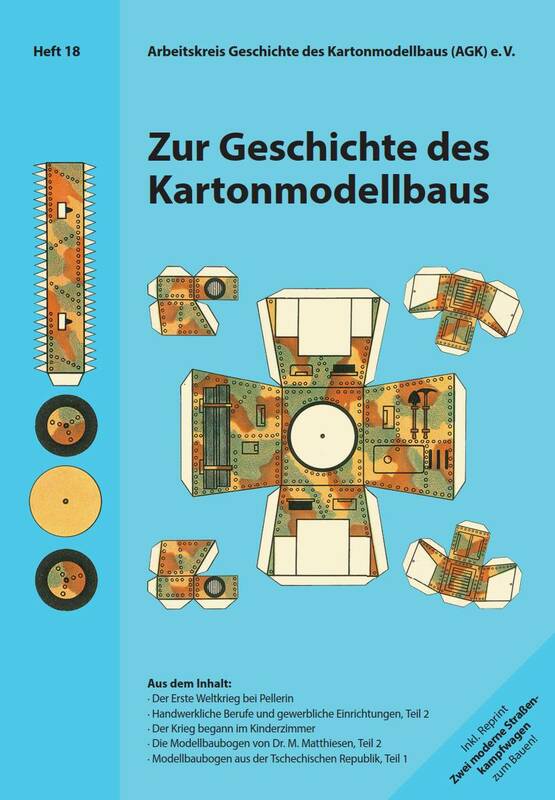 Our principal work is the maintenance and expansion of our public databases of Card models and Publisher catalogues and the publication of our annual magazine "Zur Geschichte des Kartonmodellbaus" (on the history of card modeling, in German language). We are not affiliated to publishers or other institutions nor are we dependent on revenue from sales or advertising, but we encourage an active cooperation with any interested publishers and printers, authors and museums. Are you interested in what we do? Then please have a look around. Sometimes people ask us whether we are interested in workshop reports. The answer is: Yes, we are, but only if they are helpful for our research on a publisher, designer or a specific (historically important) model; we do not offer advice to modelers about how to construct their models. There are other platforms on the web that offer that kind of assistance. We also do not have an online shop for card models.